Gorilla Technology, a provider of video intelligence and IoT technology, unveils new offerings to empower existing surveillance systems to provide advanced video analytics to monitor, detect and track people and vehicles for both commercial and residential environments, as well as smart city projects. Gorilla’s Smart Surveillance application has already proven to be a success in utilizing groundbreaking video analytics technology to perform real-time search, detect, and alert operators of suspicious activities for further investigation. The sophisticated event monitoring system improves existing surveillance operations with enhanced management efficiency and cutting-edge video analytics capability. The high density of surveillance monitoring systems deployed in commercial buildings, residential areas and public spaces require an advanced monitoring system to streamline operations in order to maximize efficiency and productivity for administrators. With the Smart Surveillance application, operators can reduce manual hours of scanning and searching for suspicious people and vehicles, using Gorilla’s proprietary technology to identify moving objects in real-time, and further track its whereabouts at any given time without interruptions over a 24-hour running system on Gorilla’s Video IoT platform. The latest release of Smart Surveillance allows easy-integration for a variety of IoT-enabled sensors with existing systems, including anti-theft door & window sensors, gas leak detectors, and smoke detectors, situated in different locations connected to the same central hub. Combined with IoT sensors’ data, Smart Surveillance efficiently extracts and processes real-time information from live camera feeds at a much faster rate, allowing operators to increase situational awareness by effectively managing multiple channels simultaneously. In addition to monitoring the smart building, the solution uses AI-based video analytics to detect, identify, and store information on vehicle license plate and log entry time in a centralized system for smart parking applications. Further, vehicle owners will be able to easily locate their vehicles, stay up-to-date and receive parking information via mobile apps. Gorilla’s intelligent monitoring system is integrated to the Dell Embedded Box PC 5000 Series, an embedded industrial computer designed for use in dirty, dank and dangerous environments, to provide optimized computing performance and flexible storage solutions for video-centric IoT applications. 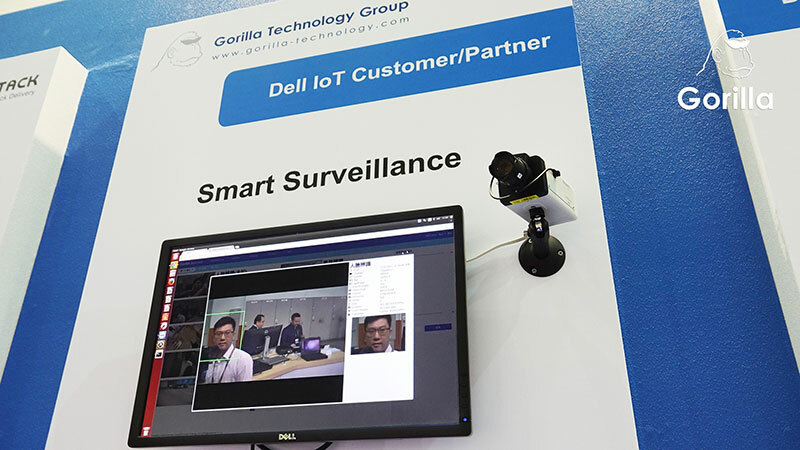 Gorilla Technology’s Smart Surveillance solution with the Dell Embedded Box PCs will be showcased at 2017 COMPUTEX, located at the Nangang Exhibition Center 4F, Booth #M0130, Dell OEM and IoT Solutions booth.